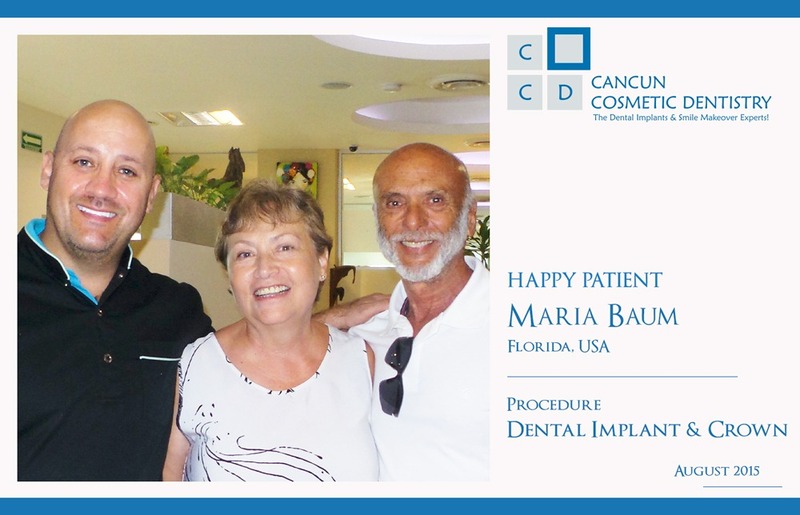 We had the privilege of having Maria Baum at our dental clinic in Cancun this year. She has been a loyal patient and has visited in the past. From the first time we were impressed by her. Maria works with an association against domestic abuse offering protection and assistance to mothers and children in dangerous situations at home. We couldn’t be happier to help her regain a wonderful smile. She came to us looking for implants and crowns when she started to lose her teeth because of her age, and we did our best to give her an improved smile. Maria was born in Mexico but now she lives in Florida with her husband… she still decided to enjoy a vacation here in Cancun and has also been to Playa del Carmen and even Cozumel. Doctor German Arzate was in charge of her dental work, and Maria couldn’t be happier with her results. She told us she would recommend our clinic and our work with her close acquaintances in Florida and we are very thankful for that. Dental work in Florida can be very expensive. Cancun is just a two hour direct flight away from Miami! Here you can also enjoy the Caribbean Sea and the archaeological sites of the Riviera Maya and the Yucatan Peninsula. You can save up to 70% on crowns and dental implants by having them done at our first class facility. Send us your x-rays and photos so we can give you a personal evaluation of your case at no charge. If you want to know more about our services call toll free from USA and Canada 1-800-565-1424, or if you are already on vacation in Cancun and want to meet us, you can call us for an appointment at the following local number (998) 1-40-51-25. Another Cancun Cosmetic Dentistry happy patient! Exclusive look at Cancun Cosmetic Dentistry!